Scientists have discovered that C. elegans, a microscopic worm biologists have used in the lab to identify important biological phenomena, suffers from natural viral infections. This may mean that C. elegans can help scientists learn more about how hosts and viruses interact. A workhorse of modern biology is sick, and scientists couldn’t be happier. 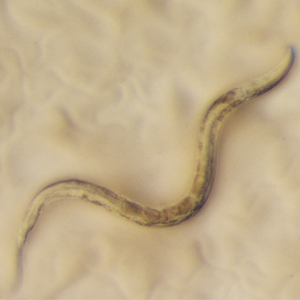 Researchers at Washington University School of Medicine in St. Louis, the Jacques Monod Institute in France and Cambridge University have found that the nematode C. elegans, a millimeter-long worm used extensively for decades to study many aspects of biology, gets naturally occurring viral infections. The discovery means C. elegans is likely to help scientists study the way viruses and their hosts interact. Wang, associate professor of pathology and immunology and of molecular microbiology at Washington University School of Medicine, says that several fundamental aspects of human biology, including the ability of cells to self-destruct to prevent cancer, and RNA interference, an important process for regulating how genes are used to make proteins, were first identified in C. elegans and later affirmed to be present in humans. The findings appear online in PLoS Biology. Marie-Anne Felix, PhD, a researcher who studies nematodes at the Monod Institute, began the study by gathering C. elegans from rotting fruit in French orchards. Felix noted that some of her sample worms appeared to be sick. Treatment with antibiotics failed to cure them. Felix then repeated a classic biology experiment that led to the discovery of viruses. Wang specializes in the identification of novel viruses. He found the worms had been suffering infections from two viruses related to nodaviruses, a class of viruses previously found to infect insects and fish. Nodaviruses are not currently known to infect humans. Tests showed one of the new viruses can infect the strain of C. elegans most commonly used in research. “Model organisms are essential to important steps forward in biology, and we’re eager to see what C. elegans can teach us about the way hosts and viruses interact,” Wang says. Felix M-A, Ashe A, Piffaretti J, Wu G, Nuez I, Belicard T, Jiang Y, Zhao G, Franz CJ, Goldstein LD, Sanroman M, Miska EA, Wang D. Natural and experimental infection of Caenorhabditis nematodes by novel viruses related to nodaviruses. PLoS: Biology, Jan. 25, 2011. Funding from French National Center for Scientific Research, the National Institutes of Health, the Midwest Regional Center for Excellence for Biodefense and Emerging Infectious Diseases Research, the Cancer Research UK Programme, the Burroughs-Wellcome Fund and the Herchel-Smith Foundation supported this research.